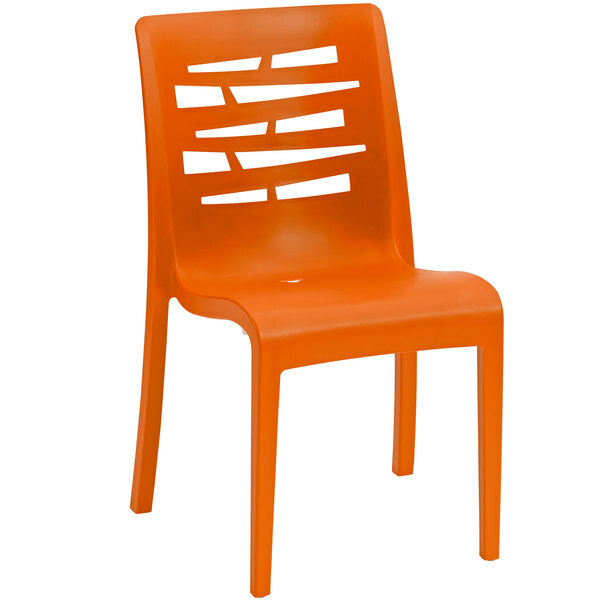 Thanks to its vibrant color and eye-catching back design, this Grosfillex US218019 Essenza orange resin side chair is sure to add character to your restaurant or bistro. This chair's innovative technopolymer construction ensures it won't get hot in the sun, making it perfect for both indoor and outdoor dining areas. It also boasts an incorporated hole in the seat that helps prevent water from collecting, allowing it to dry fast after it rains. Made with Grosfillex's proprietary air molding technology (AMT), this chair provides superior strength without the hefty weight of comparable outdoor chairs. Plus, its legs are capped with nylon glides that protect floors from scuff marks and slide smoothly, helping to keep loud, unwanted noise to a minimum. Boasting an ample 300 lb. weight capacity, this durable Essenza chair guarantees comfort as guests enjoy your signature drinks, appetizers, entrees, and desserts!